“Lionel, the Lion-Faced Boy”, actually Stephan Bibrowski, famous sideshow performer for the Barnum & Baily Circus just after the turn of the 20th century. He replaced, “Jo Jo”, Barnum & Bailey’s previous hairy man and stayed with the circus for about five years. Bibrowski was born with a condition called congenital terminal hypertrichosis, where fully pigmented, thick hair covers all parts of the body except the palms of the hands and the soles of the feet. Also associated with this condition are enlarged gums, often resulting in loss of teeth. Congentital hypertrichosis is extremely rare and there are less than 200 documented cases of this condition. Congentital hypertrichosis is sometimes referred to as “werewolf syndrome” and may be at least partially responsible for the orgins of the werewolf tales. Bibrowski was born near Warsaw, Poland in 1891 and first discovered in 1895 by a German showman, named Mr. Sedlmayer. His mother gave the boy to Sedlmayer, who began exhibiting him in Germany. Fortunately, for Bibrowski, Sedlmayer had a benevolent heart and allowed the boy to attend a German boarding school so that he might receive a proper education. In 1902, Sedlmayer and Bibrowski went to the United States, where Bibrowski begin to tour with the Barnum & Baily Circus. Bibrowski was billed as “Lionel, the Lion-Faced Boy” who supposedly was the fourth of six children, the other five all being normal. It was said that his condition was caused when his mother was pregnant and she saw her husband attacked and killed by an escaped circus lion. 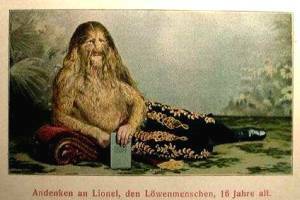 This frightful event supposedly caused Bibrowski’s lion face and hairiness, as the lion was imprinted on the unborn child. The Barnum & Baily story also attributed other feline qualities to the boy, such as sharp eye sight and night vision, which were also not true. However, the American public liked the story and Bibrowski was a success with the American circus. In 1907, Bibrowski, left the Barnum & Baily Circus and returned to Germany, where he continued as a sideshow freak. After spending several years in Germany, Bibrowski came back to the United States and worked in a Coney Island sideshow until 1928. He retire from the sideshow live and again returned to Germany, where he died of a heart attack in 1932.